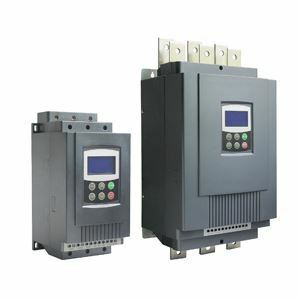 30 hp motor soft starter, 22 kW three phase 220v, 440v, 480v, 690v AC motor starter. Model GS2-022 (220v), GS3-022 (440v), GS4-022 (480v), GS6-022 (690v). Tips: Why choose a soft starter over VFD? Unless there is a requirement to vary the speed of the induction motor during operation, a soft starter is usually a better choice to reduce starting impact. Variable frequency drives (VFD) are less efficient than soft starters, so cost more energy to run (3% to 0.5% losses). VFDs only save energy if they reduce losses in the driven load by operating part of the time at lower speed. At constant full speed operation, they are less efficient. The only other reason to choose a VFD over a soft starter is to reduce the start current considerably. This can be of value where there is a very limited power supply.